H&R RSS+ Coil Over for the Audi RS3 | H&R Special Springs, LP. For RS3 owners, the H&R design team has made performance personal. If you like to adjust your suspension for different performance levels, now you can with H&R RSS+ Coil Over with adjustable shocks. Each RSS+ shock has a precision adjuster to dial in the performance level you want. The adjusters precisely tune both rebound and compression dampening together so you always have the correct shock balance. 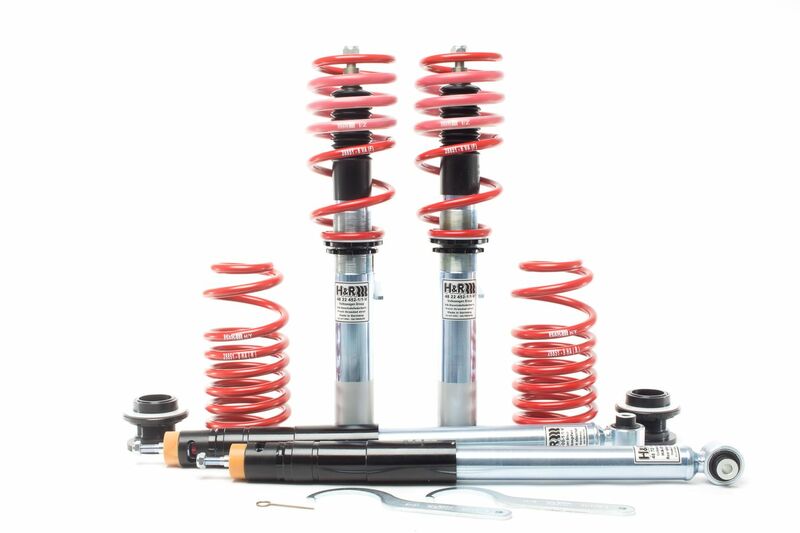 H&R RSS+ Coil Over includes all the features of the RS3 Street Performance Coil Over plus adjustable shock dampening. H&R RSS+ Coil Over (part #: 32851-25) feature H&R’s MONO – Tube adjustable shock technology for precise personal control. Lowering is adjustable between approximately .80 to 1.6” in the front and rear. Lowering the vehicle’s center of gravity improves handling and creates a sleek European stance – Ausgezeichnet! Like all of H&R’s products, H&R Street Performance Coil Over are 100% made in Germany.